A runner who battled a back injury has completed 401 marathons in 401 days. 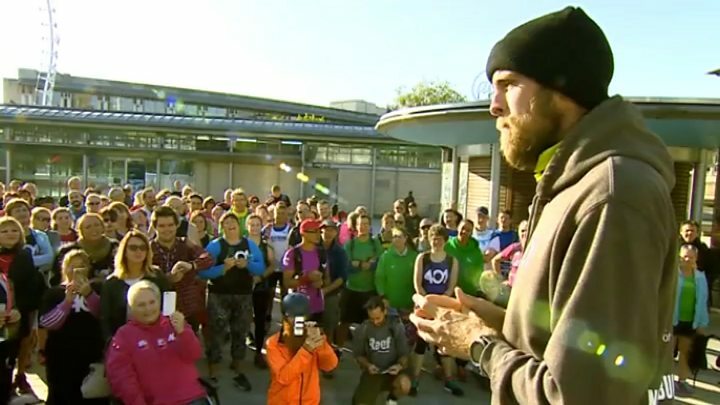 Ben Smith, 34, began his charity attempt on 1 September 2015 and ran 284 consecutive marathons in 284 days. He then developed an umbilical hernia in June which forced him to stop for 10 days to recover before resuming and making up the lost mileage. Mr Smith, from Portishead, was joined by about 350 people who set off with him at 10:00 BST on his 401st marathon. An emotional Mr Smith was cheered through the finish line by hundreds of supporters and thanked his parents, partner and team for their support. "I think I'm in a bit of shock," he said. "I can't believe we have done this. "Without every single person who has taken part, we wouldn't be where we are now and I can't thank you enough. I am sure the charities will thank you." He reached his fundraising target of £250,000 as he arrived at the halfway point in Portishead earlier. "We've just had some great news, I'm going to cry now... you can still keep donating," he said. The return loop from Millennium Square in Bristol to Portishead took the runners about seven hours to complete and saw Mr Smith enjoying a burger and chips along the way. Before setting off, he said he was feeling "nervous but excited" and expected the run to be emotional. "I'm actually aching today, my legs have been alright for the last 101 days and typical, last day, legs ache, back aches, but I've got one day left," he said. "I'm doing this to raise £250,000 for two anti-bullying charities. "I was bullied for eight years of my life at school. It affected my confidence and self-esteem and that led to me trying to take my own life when I was 18." After coming out as gay, the runner wanted to raise awareness of the damage caused by bullying and to support his chosen charities, Kidscape and Stonewall. He said: "A key objective of The 401 Challenge has been to involve as many people as possible and create opportunities for children, young people and adults to discuss the difficult topics of bullying and sexuality." After the final marathon, his team have put together a three-month "cool down" involving a month of back-to-back half marathons, followed by a month of 10km runs and a month of daily 5km runs.